Doc Holliday: History's most notorious dentist. June 11, 2013 -- John Henry "Doc" Holliday is America's most notorious dentist. 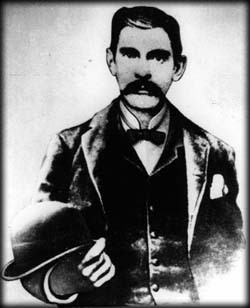 Wyatt Earp's brother Virgil described Doc Holliday as "gentlemanly, a good dentist, a friendly man" and a "slender, sickly fellow." Another friend, lawmaker Bat Masterson, told a biographer that Holliday "was afraid of nothing on Earth." schools, receiving a secondary education that included Latin, classical Greek, and French. In addition to his formal education, he was schooled by his father and other male relatives in the use of firearms, as were all well-bred Southern gentlemen of the era. Holliday's father served as an officer in the Confederate Army. His mother died of tuberculosis a year after the war ended, when he was 15. Young John Henry learned to play cards from a young mulatto servant named Sophie Walton. "With a deck of cards in her hands, she performed wizardry," wrote Ed Lanham, a Holliday biographer. Under her guidance, John Henry "became addicted" to the various card games of the era. He spent hours practicing with her and developed into a cardsharp. preceptor in Georgia. During his apprenticeship, Holliday performed extractions and filled teeth. Following the apprenticeship, he returned to Philadelphia, resuming his studies for an additional 22 weeks. On March 1, 1872, he received his Doctor of Dental Surgery.